The below artworks are the most important by Raphael Soyer - that both overview the major creative periods, and highlight the greatest achievements by the artist. Artwork description & Analysis: The most striking aspect of this double portrait is the symmetry of the subjects' expressions; Soyer's parents appear drawn and exhausted and their eyes resigned and tired. His father rests his head in one hand, while his mother's sturdy arms are folded in front of her body. They are sitting at a table, and behind them, one can see a cabinet with a mirror on top, a family photograph, and a light switch. The colors are muted and dull, but the brushwork is energetic, almost impressionistic. This poignant work epitomizes the feelings and attitudes shared by many during the Great Depression. Drawing influence from the Ashcan School's preoccupation with the ordinary, everyday lives of working-class New Yorkers, Soyer encapsulates their world-weary experience through their whole body - from their slumped postures, their exhausted eyes, and in his father's furrowed brow. The way in which the work draws the viewer to the subjects' eyes invites compassionate and poignant examination. He has not flattered them - that was not his concern - rather he presented the truth of their character. He could have omitted the unappealing wall switch from the painting, but he wanted to present an accurate representation. As curator Ori Z. Soltes explains, "The work is a powerful statement of how the older generation suffers the pains of the immigrant condition.... With all of its problems, the Old World offered the comfort of familiarity. The New World, with its own language, culture and customs, offers shock and conflict. We see the artist's parents self-isolated, caught between the Old World and the New, their bodies here and their minds there." Artwork description & Analysis: Five men, seated around a counter, drink coffee from tin cups and eat bread. Placed before a blank, featureless background, the men do not interact with each other. The contrast between light and dark creates a bleak atmosphere, and the men stare past each other, save the one in the center, who looks out toward the viewer instead. Soyer's depiction of newly arrived immigrants and those suffering from the Great Depression led to his reputation as an American Scene Painter, and his paintings and prints are among the most evocative representations of the period - a time when men would spend hours in bread lines in order to obtain a stale loaf for their families. Soyer renders these works with a sympathetic eye, showing his affinity with the immigrant poor and perhaps drawing on his own experience of sadness and isolation. Soyer was a skilled lithographer, and he considered this to be one of his most important works. The grim portrayal of their silent consumption of basic rations is reminiscent of Vincent Van Gogh's The Potato Eaters (1885), which drew attention to the harshness of Dutch peasant life. Soyer used harsh light to accentuate the gaunt and furrowed face of the malnourished figure in the foreground, who holds a piece of white bread in his hand that recalls the white, stone-like potato in van Gogh's painting. Thus, the 20th century artist updates van Gogh's subject in the setting of Depression-era New York. Using homeless men he befriended in the Bowery as his models, Soyer depicts their dejection and defiance. Artwork description & Analysis: Soyer presents a closely cropped snapshot of the bustle of afternoon rush hour. Figures, hemmed in by the skyscrapers in the background, move in various directions; he depicts two women frontally, as if they were walking toward the viewer, and two more women and a man face rightward, with one of the suit-wearing women holding on to her hat. All of the figures are presented in dark clothing except the most visible one: she wears a white blazer over a dark shirt, with pink flowers pinned to her lapel. She carries a bag and a newspaper under her arm, and with her shoulder-length blond hair and tilted hat, she looks out at the viewer. Soyer sought beauty in the ordinary and everyday and turned to the streets around his Union Square neighborhood for inspiration, and he was fascinated in particular by female subjects, the "New Women" of the city. Soyer often took up as painting subjects these professional women, who worked clerical jobs in offices or as shopgirls in the increasingly popular department stores; he emphasized their independence but also suggested that they were, in his words, "usually not very happy." The urban type of the "New Woman," as she was called, provoked endless commentary. One reviewer, upon seeing Office Girls, declared that the young women were "not particularly enticing" and were "thin, wiry, alert...still showing the nervous strain of their days." As art historian Ellen Wiley Todd explains, the reviewer was offended that their work, though consequential to urban life, undermined their femininity. As a spokesman for the underdog, Soyer aimed to create art out of common experiences. While often described as a Social Realist, Soyer avoided propagandistic portrayals and preferred not to politicize his subjects, rather he wanted to depict the truth of what he saw before him every day on the streets and in cafes and bars. Artwork description & Analysis: In this dark and powerful piece, twelve men sit in a waiting room. One carries crutches, another reads, and one man in the background hunches over, perhaps asleep. They are homeless and desolate, sitting on rickety chairs waiting to hear if they will be given a place to sleep. The central figure leans towards the viewer, and his earnest expression, submissive pose and positioning of his hands suggest that he is begging for help. Though painted in muddy, earth tones, the artist uses a warm light to highlight his subjects' expressions - expectant, resigned, tired, and bored. During the mid-1930s, Soyer often painted homeless men; Soyer recalled, "I painted people who were out of work. I mean, they just sat there, either in the sun or in the shade, and did nothing. I painted them a lot. And that too may have been considered Social Realism." In the left foreground of the canvas, a man leans forward, and one sees the face of a familiar character in many of Soyer's works: Walter Broe, an elderly homeless man who had been the only child of poor Irish immigrants. Soyer met him one night trying to fish for pennies using a stick and some chewing gum near the Whitney Museum of American Art. Soyer offered him a job modeling and then recommended him to his friends, helping him off the streets and letting him live in his studio. In life, as in art, Soyer was an advocate for the immigrant, the down-and-out, and the dispossessed. Soyer, like Dorothea Lange and Walker Evans who photographed the laborers and downtrodden during the Depression, depicted these men with, as the Blanton Museum explains, "unflinching honesty and uncommon humanity." Artwork description & Analysis: In this portrait, we see a woman, bare chested, looking down, and holding a deep red garment to her breasts. She appears awkward and self-conscious as she stares down at the floor, seemingly, to avoid the viewer's gaze. Her dark messy hair frames a vulnerable face that is deep in thought. While Soyer emphasizes her sexuality by positioning her breasts in the center of the canvas, art historian Bryna Campbell explains that he does not objectify or demean her through a stereotypical depiction but instead highlights the alienating effects of such stereotypes. Soyer presents to the viewer a quiet and sensitive exploration of psychological estrangement experienced by young women and immigrants in the chaotic, urban environment. The brushwork and light touch of his paint, along with the subject matter, which he returned to often, calls to mind the realism by French painter Edgar Degas. In the 1920s, Soyer's twin brother Moses was working in Paris when he sent Raphael a book on Degas that was to become a treasured possession and a significant influence on his work. Speaking in 1981, Soyer said, "I still have it. It's one of my precious books. I was always more interested in the more psychological art. I mean, artists with a kind of psychological bent." Instead of depicting the structures and mechanisms of the increasingly capitalistic society as many Social Realists did, Soyer opts to explore the psychological toll on the individuals living in and oppressed by the capitalist order. Artwork description & Analysis: In Cafe Scene, a woman sits alone at a small table for one. Her bright red lipstick emphasizes her pale face as she stares away from the viewer, lost in thought. Although calm, quiet, and still, her crossed arms and legs suggest an inner-turmoil which is brought into sharp relief by the posture of the only other figure in the canvas: a man in the background, sitting relaxed with hands in pockets. This observation of disquiet, or unease, became a common motif of the artist's and a metaphor for the social isolation of modern life. Her blank expression invites viewers' interpretations and speculations. Soyer's brushstrokes are rough and imprecise, and he relies on color instead of line to create the scene. As art critic Paul Richard wrote, "Many are the portraitists who harp on props and details, the gleam of a pearl earring, the goblet on the table there, the shine of silk or leather. Soyer is not one of these. Nothing in his pictures is portrayed in sharp focus; they owe nothing to the photograph - except, perhaps, their eerie sense of the instant seized." 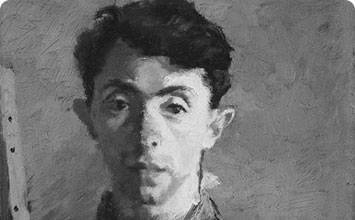 Following the example set by the Ashcan School, Soyer was fascinated with the daily lives of working-class New Yorkers. This work displays his unique eye for intimacy and mood. Unlike many painters, Soyer refused to accept commissions; instead his interest was with the personal, and through his portraits of the anonymous working class, he made a study of the effects of the modern world on the psyche. Artwork description & Analysis: In this group portrait, Soyer portrays numerous realist painters, including Leonard Baskin, Edward Hopper, Reginald Marsh, Jack Levine, John Koch, Edwin Dickinson, Henry Poor III, and John Dobbs, as well as himself, his brother Moses, his daughter Mary, and Lloyd Goodrich, the biographer of Eakins and friend to realist painters. Painted in the first half of the 1960s when Abstract Expressionism dominated the markets, Pop Art was making its way into the galleries, and artists were turning to more experimental modes of art making such as performance, Soyer double-downs on realism and presents its American tradition on a large scale. He painted each figure separately from life (except Marsh who had already died) and arranged them later on the larger canvas. In the background, one sees Thomas Eakins' paintings hanging on the wall, including his famous The Gross Clinic (1875), Salutat (1898), and William Rush Carving his Allegorical Figure of the Schuylkill River (1908). By positioning these men in front of Eakins' masterpieces, Soyer creates a lineage that underscores the seriousness and thoughtfulness of the realist tradition. He made numerous sketches of each men and wrote about each in his diary, and during this time, Soyer enriched his commitment to realism by studying the works of Delacroix, Leonardo da Vinci, and Rembrandt. 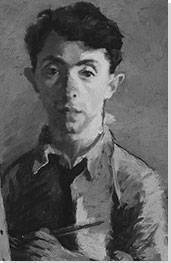 In a letter to Joseph Hirshhorn, the eventual purchaser of Homage to Eakins and all of the ancillary sketches, Soyer admitted, "I am working on the painting now, inch by inch, and am beginning to have the usual anxieties about overworking it. It is a characteristic of artists - ever apprehensive, anxious, and uncertain." Perhaps Hirshhorn would have heard an echo here of another artist he was collecting around the same time - the Abstract Expressionist Willem de Kooning - who was notorious for not finishing paintings and who said he worked out of anxiety and doubt.